Many seniors struggle to maintain their independence and mobility in their home, as it becomes more difficult to do simple tasks like walk up and down the stairs. This forces a lot of senior to leave their homes for either a single-level house or to live in an assisted living facility. A stair lift from us at Indy Stair Lifts will allow any senior to regain their independence and mobility. A stair lift for seniors uses a track and battery powered chair to safely and efficiently carry a person between floors in their home. The track is installed along the side of a staircase and uses a regular wall outlet to charge the chair’s battery. Whenever the stair lift is not in use, the battery charges and this allows you to use the stair lift even in a power outage. A fully charged battery will give you up to 40 trips. 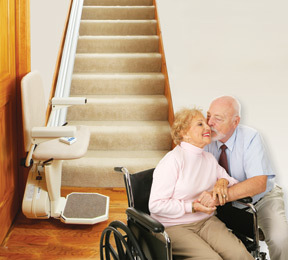 Our stair lifts come with either straight or curved tracks. Many staircases go straight up to the next floor with no turns. However, when a staircase does take a turn before reaching the next floor, you will need a custom curved track for your stair lift. All of our stair lifts come with a chair that swivels, foot rest, arm rests, seatbelt, and the ability to fold up. The chairs swivel when at rest for easy on and off access. When you ride one of our stair lifts, you should buckle the seat belt, place your arms on the arm rests and feet on the foot rest. This will ensure that you have a safe ride every time. When you are not using the stair lift, it folds up against the wall so it does not hinder the stairway. If you are a senior and have trouble using the stairs in your home, you would greatly benefit from having one of our stair lifts in your home. Regain your independence and maintain your mobility with a stair lift for seniors from Indy Stair Lifts.